On November 18, 2015, Monica Taylor, a teacher at Central Middle School in Riverside, California, stood in front of scores of impressionable young minds hoping her guest for the day would spark their interest in geography and mapping on a very special day—GIS Day. “Who knows what a cartographer does?” Taylor asked the students at the assembly. The group included the seventh and eighth graders enrolled in the life sciences and physical science classes that she teaches. 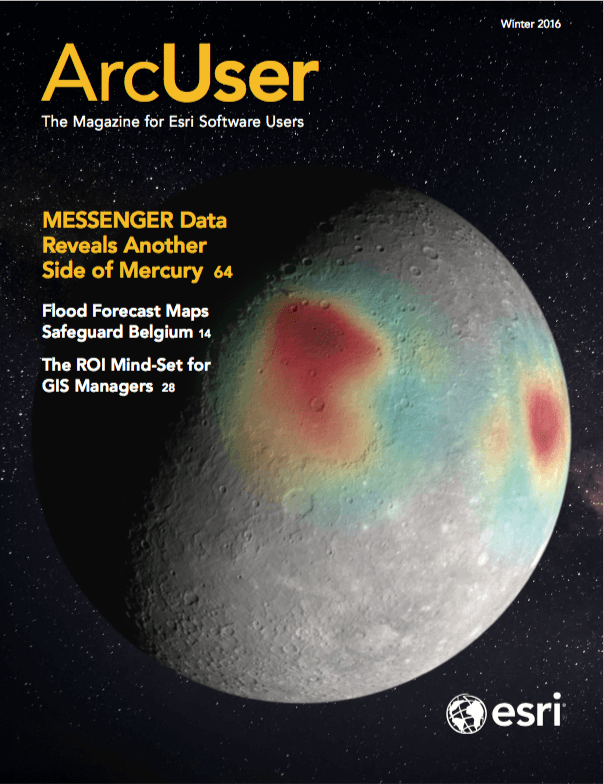 “A cartographer is a mapmaker. It’s not old school, where you are drawing [maps] on paper. They make them on computers,” she said. Jennifer Bell's father nutured her love of maps, which led her to a career as a cartographer. Taylor then introduced a real, live cartographer to her classes: Jennifer Bell. 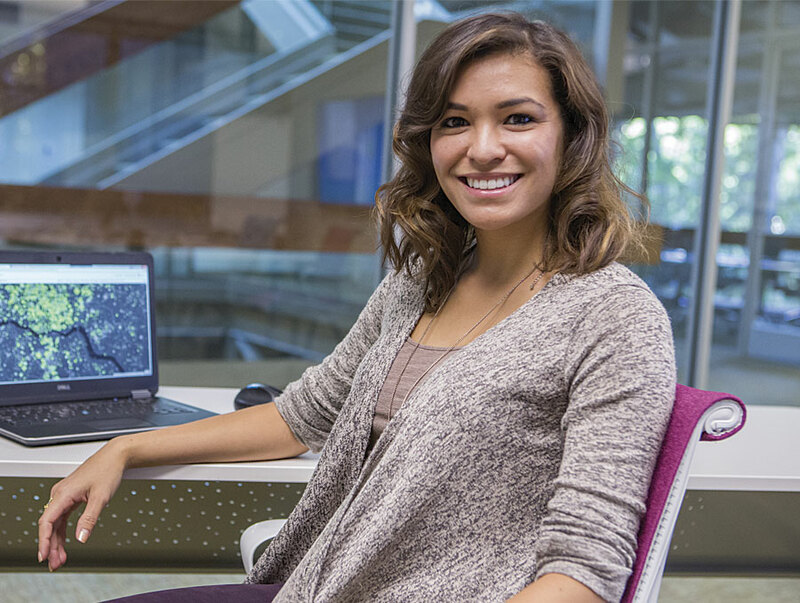 The talented, upbeat 26-year-old is a cartographic product engineer at Esri in Redlands, California. Bell often smiled as she told stories about working at what she describes as her “dream job” at Esri. Bell was born in Saudi Arabia, where her father worked for the Saudi Aramco Oil company, and she traveled extensively as a child. This made her more spatially aware of the world than most young Americans. 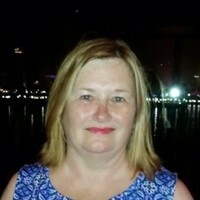 She went on to obtain bachelor’s and master’s degrees in geography from the University of Georgia. Passionate about her career as a geographer, Bell also hoped to elevate the kids’ sense of geographic awareness. She brought her show-and-tell presentation of online maps and videos to Central Middle School to demonstrate how maps relate to students’ lives and their future careers. She also wanted to give them a taste of what she does at work. Taylor sees geography as an avenue for students to better understand the world around them. She said that some children do not know where California is located on a map. Her concerns are well-founded. A recent report issued by the United States Government Accountability Office entitled “Most Eighth Grade Students Are Not Proficient in Geography” states that 75 percent of eighth graders in the United States did not demonstrate competence in the subject. While underscoring the importance of geography in a world where people use maps on their cell phones to find places and mapping is used to track diseases like Ebola, the report says that misconceptions within the education community continue to exist about what geography studies involve. 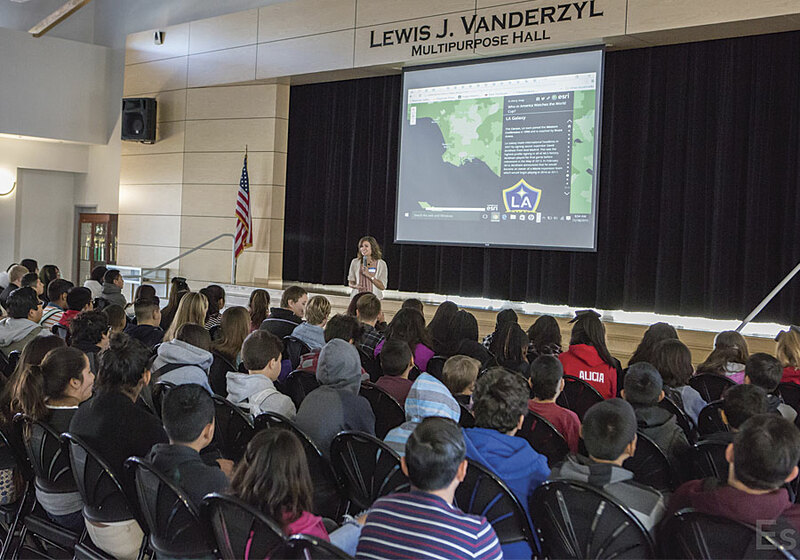 In a GIS Day presentation, Esri cartographyer Jennifer Bell shared her passion for geography with schoolchildren at Central Middle School in Riverside, California. “Do you know what today is?” Bell asked the middle schoolers. Some were attentive; others were squirming in their seats. “GIS stands for geographic information systems, technology used to create maps that can be viewed online and on your cell phones,” Bell said. GIS Day, held annually in November, celebrates GIS technology. “GIS is like geography on a computer,” Bell told the students, who do their lessons on Chromebooks issued by the Riverside Unified School District. Cartographers, scientists, and others, she said, use GIS mapping software created by Esri to turn information collected about practically anything imaginable—birds, diseases, earthquakes, crime, sports, and weather—into maps that tell stories. Bell showed the students a series of Esri Story Map apps. These mapping applications tell stories using a mix of maps; imagery; text; and multimedia such as photographs, videos, and music. The Discovering Liquid Water on Mars story map included NASA imagery that contained an element of mystery: strange-looking marks running down steep Martian slopes. “What do you think those dark streaks are?” Bell asked. “Water!” several children said in unison. “They look like water, but they are hydrated salts, proof that [salt]water is on the planet,” Bell said. The children’s eyes really popped when they viewed a map of Kathmandu, Nepal, which was devastated by a magnitude 7.8 earthquake in April 2015. The map contained before-and-after satellite imagery. Bell used a slider feature in the map to show them what the city looked like before the quake and afterward, when many buildings had turned to rubble. Some of Taylor’s students are studying earthquakes, which gave Bell an opportunity to talk about maps they can make using their Chromebooks and ArcGIS Online, free online mapping software that Esri is providing to all the K–12 schools in the United States as part of the ConnectED initiative. “Mrs. Taylor got all of you guys ArcGIS Online accounts,” said Bell. “[Now] you have the resources to make maps.” Taylor plans to take advantage of these accounts. Students can start out by creating story maps about topics they find interesting, such as sports, trucks, and vacations. Bell will return to Central Middle School to teach the instructors how to use ArcGIS Online and work with their school accounts. By summer 2016, Taylor and other teachers will have access to instructor resources for The ArcGIS Book, which introduces web GIS. 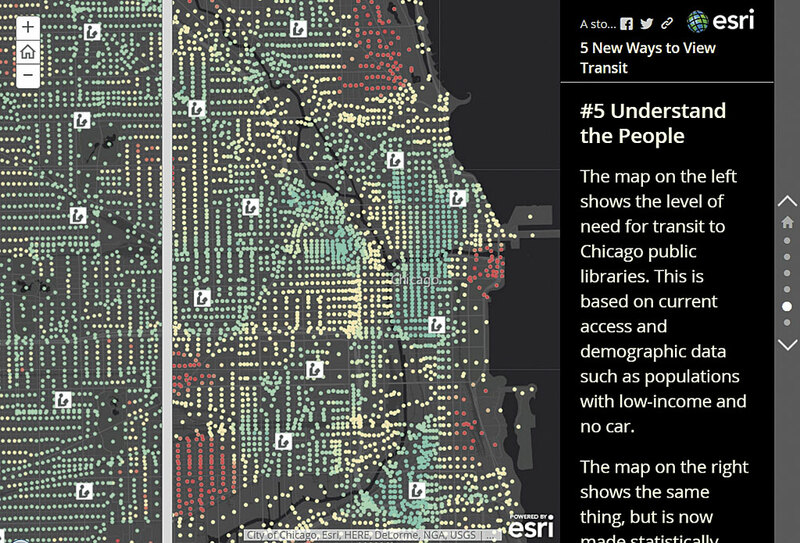 Bell's work at Esri has focused on transportation and urban systems. While teachers play a role in geography, Bell also thinks parents could do a better job introducing their children to spatial concepts, even if it is just quizzing them about how to get to the grocery store. She did a pop quiz to help the young people understand that maps can relate to anything in life. “What do you want to be when you grow up?” Bell asked the students. “A neurosurgeon,” said one student. “A neurosurgeon can map the human brain,” said Bell. “We can map the spread of diseases and predict where they will go next,” said Bell. “A lawyer,” said a third. “You can track where your client has been and provide an alibi,” Bell said. Bell spoke to more than 500 students over four hours. Before she left Central Middle School on GIS Day, she learned that three of them had expressed an interest after the assembly to join the science club.